It’s a stellar question for spurring self-improvement because we all have things we could be doing better. You want your fleeting time on Earth to matter, right? 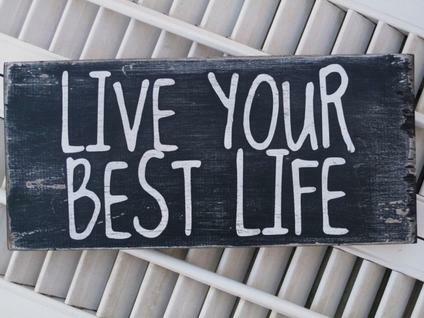 Here’s how to live a better life, one that others will remember. Making the world a better place–by being free with your time, energy and money–is a good place to start. By doing so you can create a domino effect that encourages others to follow in your footsteps. In fact, a recent study conducted by Cornell University sociologists Milena Tsvetkova and Michael Macy supports the idea that generosity is contagious. They point to remarkable “pay it forward” situations, such as the drive-through shop customer who a year and a half ago picked up the tab for the next customer in line at a Manitoba coffee shop, setting off a chain reaction that kept going for the next 226 cars. Their research, which involved an incentivized game people could invite others to play and thereby bestow financial rewards to them, demonstrated that receiving help increased the likelihood that a person would be generous to a stranger. “We concluded that observing an act of kindness is likely to play an important role in setting a cascade of generosity in motion, since many people can potentially observe a single act of helping. But we found that it was receiving help that sustained the cascade as it spread through the group,” they write. There’s a reason it’s called the green-eyed monster–jealousy is ugly. And where did it ever get you, anyway? Whether you fear losing a relationship or wish you had things other people have, you need to let go. When it comes to your relationships, nothing is more attractive than genuine confidence. And as for having stuff, remember: You can’t take it with you, so why fret about what you’re supposedly missing? Besides, you have a lot. Consider that penicillin, the first antibiotic, wasn’t clinically tested and mass produced until the 1940s. Before that, billions of people throughout the course of history died from bacterial infections. Losing a child to sickness–something most people loathe to imagine–was commonplace. You also live in a society in which you are completely free to choose your own destiny and pursue happiness. This isn’t the case everywhere on the planet and much of the world’s timeline has been stained with murderous wars that, again, have taken the lives of billions of people. You’re alive. Be grateful for it. It’s hard to be appreciative when you feel like crap. Exercise every day and always take the stairs. Drink water instead of diet soda, which is remarkably bad for you. Eat foods rich in anti-aging antioxidants–things like berries, red peppers, dark green vegetables, garlic, tea and fish. Eradicate a fear of failure. Fear of failure can deter people from taking action yet if you never try anything you’ll never achieve anything. In fact, falling on your face can be a good way to learn valuable lessons. Successful entrepreneurs, for example, realize the importance of failing as quickly as possible when launching a new venture because the faster you find bugs and problems, the quicker you can get rid of them. Failing isn’t easy or fun, but you can’t let it dictate how you live your life. I learned this several years ago when I went back to school, elbowing up in my middle age to young fresh-faced college students. One some levels this endeavor–which felt daunting at the time–was a devastating failure. Yet, looking back I’m now proud of my hard work and how I mastered tough subjects like math and science. My experience also prompted me to aggressively pursue a writing career, which is where I was meant to be anyway. My dad tells the story of a former co-worker named Bill Sander who was always positive and giving people the benefit of the doubt. I’m not a perfect parent. I spend too much time on the computer and I’m often distracted. But one thing I’ve learned over the years is that spending time in the moment giving a good story to a child covers over a host of parental sins. I’m not just talking about “Green Eggs and Ham” or “Goodnight Moon.” Every morning before my pre-teens get on the school bus we climb back onto my bed and I spend 15 minutes reading some kind of quality literature to them. They gravitate toward this ritual and I hope someday they’ll remember this time a bit more than all the years I spent working. What are your ideas on how to live a better life?